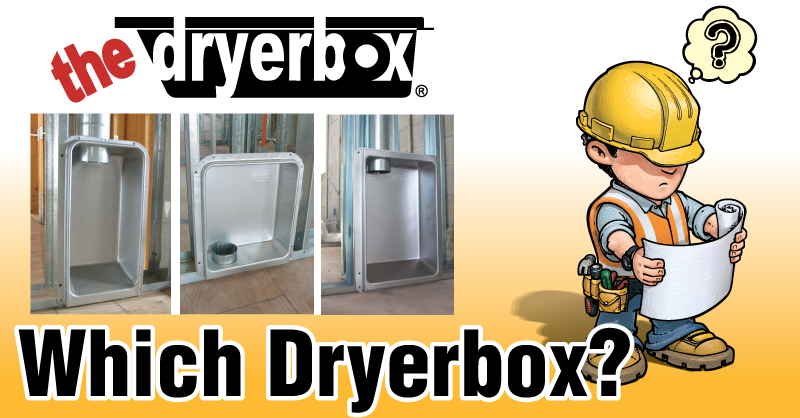 Which Dryerbox model is right for your job? Choosing the correct Dryerbox model is easy. Using our selector tool, you simply choose whether your install is existing or new construction, what type of wall it is to be installed in and voila! If you have questions about the models, you can contact us as well. First, choose the type of dryer that is going to be installed. Is it a freestanding model? Pedestal? Stackable? If not known, you can still choose your Dryerbox. The next question is "which way will the airflow be directed? Upwards, downwards, sideways or rear? Lastly, choose the wall depth. 2x4? 2x6? Click here to choose your Dryerbox today.